This tutorial will guide you through setting up and using WWWinamp, a Windows web server-like application that allows remote control of Winamp via any web browser. If you run a media server in your house and want to be able to control what’s playing in Winamp without having to go to that server, this is the program for you. To get started, download and install WWWinamp. It might go without saying, but I’ll do it anyway, you will of course need to have Winamp installed as well. The installation of WWWinamp is very straight forward – you’ll mostly click “next” a bunch of times. Once the install has finished, you’ll need to edit the config file. To do so, click Start -> All Programs -> WWWinamp -> WWWinamp Configuration. Scroll down to the port: section of the file. Select a port to use to run WWWinamp on. The default is 80, but I prefer to use 8090. Whatever you choose, make sure it isn’t one that conflicts with another program running on your PC. Now save the config file by selecting File -> Save. Launch WWWinamp by clicking Start -> All Programs -> WWWinamp -> WWWinamp Server Start. If a firewall window pops up, make sure to click Unblock. The WWWinamp server window will appear. Assuming all went well, it will end with “entering server loop”. If there’s an error, read it carefully and go back to the config file to correct any mistakes. Test out WWWinamp by entering http://localhost:port in a web browser on the same PC that WWWinamp is running on. Remember, the port you’ll enter is the one you specified back in step 3. If you opted to specify a user name and password, you’ll need to enter them here. You should be presented with a window similar to the one below. Click on Show all to display your MP3s. Click on a song to have it start playing in Winamp. If Winamp isn’t running, WWWinamp will tell you. To start Winamp, add /admin to the end of the URL to enter the admin section of WWWinamp. So your URL will look something like: http://localhost:port/admin. Now click the Try starting Winamp link. That should launch Winamp and the song you previously selected will start playing. From the /admin section you can also jump to songs in the queue, remove songs from the queue, etc. 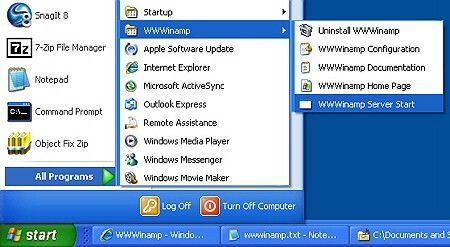 To access WWWinamp from your iPhone, iPod Touch or other Internet connected device, enter the IP address of the PC running WWWinamp (don’t forget :port) in its web browser. Now you can control Winamp remotely. Accessing WWWinamp thorough an iPod Touch. Accessing WWWinamp through Opera mobile. You can also just download Winamp Remote. Which allow you to access your media library from any web browser. You can also access your library from your mobile phone (including iPhone 3G), Wii, PS3, & Xbox 360 You can even stream music & videos to your friends.